Babs - Hope it is not still in the 90's. I've had to have the heat on here! Brandi - Thank you for thinking of us. Bearly - Our nursing homes seem very limited as to what they can do. They have prescribed an anti-anxiety medication but he refuses his medications most of the time. Same with the food as he thinks "they" are putting things in his food to keep him sedate him. Sister - Glad to hear you are feeling better. Will watch for your news about your recent trip. Northern Rose - How nice to see you. Hope you and yours are well. 4 Donks - Great to hear that you can swallow again and that you put on three pounds. Continued progress and good health. Hope I haven't forgotten anyone. My bro had a procedure on his kidneys Friday. He had a nephrostomy on both kidneys. He was unaware when he went for a 'procedure' to drain his kidneys that he would have two bags. SIL was present also when the procedure to drain the kidneys was explained to them and they are stunned they missed that part. Back to nurses making home visits. We will take my Mom to him on Sunday for two or three days, if he's well enough. Still no date certain for lung surgery. Yes. I understand. Sometimes it helps if my Dad if they give him a sip of something before he takes his meds or if they give him some ice cream. One nurse told me when he starts refusing his meds it is near the end. Well, that was a year or so ago. One time I asked him if he wanted fruit. As I leave, the nurse comes in with his meds in applesauce. First, he hates this, he would rather take it and not have it in applesauce, Second, he thought that was the fruit and was trying to say he wanted the fruit cup I give him. So, sometimes it is a matter of something that is real. The one nurse will say, your daughter wants you to take this. Then he does it right away. The food looks terrible. I take him to the cafeteria and get him real food that is soft to chew. He eats it. He also likes to pause for a while after he has eaten so much, then when he is ready, he will start again. When he is in the lunch room with the aides, they won't let him pause because they think that means he is stopping, so he closes his mouth when they try to feed him. It is just knowing your patient and asking why they don't want to do certain things. If they cannot communicate, first thing is to find a way they can communicate, like make a board with what they need or want on it. Or make several boards one with body parts and maybe a picture of ouch. There are many sites that have picture communication on them. You can laminate the pictures, cut them up, and put them on a page that can be put in a communication book. Make sure you get some verbs on the page that would match. Fr example, when Cubby could not talk I used Boardmaker and got pictures of body parts, you can use real or Boardmaker pictures. Then on the top row I put ouch, open wide, fell, and other verbs that you may need to tell someone about your body. I also put a page with crayons, pencils, scissors, etc. then the words I need, please, etc on that page. I must have made 20 or so pages. The problem I had is that people asked to borrow so many of the things I made, that eventually they did not get returned. I wish there was a job that helped people communicate. I would love to do this for others as it really helped facilitate communication and made for many less misunderstandings. I would love to help people communicate. I have been able to do this (facilitate communication) in my real life with people who don't speak a word of English. I asked someone setting a table to get me a box from under the counter to put the rest of my sandwich in when the waitress was not available. When she got back, she asked me where I got the box from. I told her the man that was setting tables. She said he doesn't speak a word of English. I was so used to gesticulating that I had no idea he did not speak English because we were able to communicate so well. Anyway if this is not the problem, I hope you find a solution soon. Is there anyone he totally trusts that could help him out? Like I do for my Dad, even when I am not there? If they say, "Can's Mom wants you to take this." Will that help? Wish I lived closer. I am sure you have done everything you can think of. Unfortunately, it comes along with many of the diseases. So sorry, my friend, for your Mom and your family. I know you all worry about her and your brother. Hi bearly. Sorry to have taken so long to respond. We went to visit my brother. The factors you mention with regard to encouraging nursing home residents to eat are indeed very insightful and with your Dad, helpful. DofN told me that one brings their character with them into the dementia, and due to inhibitions being lowered, that character is often exacerbated. For instance, he is very rude with staff and nurses etc. and will not hesitate to tell them to "shove off"! My Mom's ability to encourage him to take his pills, or do anything for that matter, is ineffective. She is the last person he will 'listen' to. The more they try to get him to eat, the more he balks. My Mom suggested when he won't go to the dining room they take his tray to his room and quietly, and without saying a word, place it on his night table. (We take him healthy snacks and drinks and place them there, and he eats that) The other day the charge nurse told me she did this one day, and he ate his food. Patting herself on the back, she spoke as though she had an epiphany and performed a miracle. My Mom has had numerous calls from staff asking for suggestions. I could not resist telling the woman my Mom has suggested they try this countless times to many nurses and staff. This same charge nurse phoned my Mom one day,( knowing full well she lives out of town) and asked her if she could come in right away and get him away from the exit door. It would take two to three hours for me to get down to Mom's and bring her back to the nursing home, where I live, before she could appear. Anyway, I'm showing my frustration, so I won't continue. Your beautiful communication skills, your patience and problem solving are remarkable. Cub got the right Mama, there is no doubt. When I was engaged, his Mom had a tube coming out of her back that I had to remove the bandage, clean around the port, irrigate it, and then re-bandage it every 2 days. When she went to her DIL's house, the port would get infected and she would end up in the hospital. This DIL was "too busy" to do it every 2 days. She worked in the hospital drawing blood and was a supervisor in the lab. One would think she would take great care of it since she knew of the consequences of bacteria, etc. It used to drive me nuts, so I told her to just stay at our house and she did. There were no more infections. Is this what you are talking about that needs to be done? Is he okay with that being done? If not can your SIL learn how to do it once in a while until he gets used to their procedures? You, your brother, and your Mom and her husband are in my prayers. I know you are giving it your all, especially Mom. Today is the block party at my Dad's. I promised a friend that I would go and watch her Zumba class. Gotta run. Take care. I really wish I could help you out. Yes, bearly, the procedure sounds the same except it is done daily. My sil did it for the first time on Wednesday. He had a bilateral nephrostomy. He will have to have this procedure done again at the end of the month to change the tubes. Hopefully, because there is now a pathway, it will be easier for him. Lung surgery is scheduled for Nov. 8th. Zumba class? Bet your friend was happy to see you. Did you enjoy it? Had very sad news this week. Found out my cousin lost two of his granddaughters and grandson is in critical condition. From a horrific car accident, Another young man in the car has died and man in the truck they hit died. From what the report says the kids weren't wearing their seat belts. Why do kids thing it wont happen to me. 2 others are in critical condition as well. So very sad. Haven't been able to get a hold of my cousin. Thanks Babs for your help finding the info we did find. So sorry to hear of this awful tragedy GE. Continued Prayers for all who are in need for them. Hope everyone has a great day. Going to see my college daughter this weekend. Gotta make tailgate food. Storm Karen headed to Alabama but hopefully it will just be lots of rain. No wind. 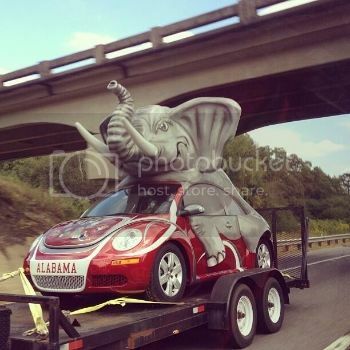 I don't think any of us Alabama monkey rednecks live near the coast, do you? Have a nice weekend- got the dentist on Monday. Hope you enjoyed your weekend with your daughter. How was the food?! Can so sorry you are feeling so frustrated. Continued prayers for you all. All I can say is take it one day at a time. There are no easy fixes when a family member has dementia. So glad you got to see your brother. I have been thinking about you and him. You are all in my prayers. Check out these photos. They are amazing! This one is cute, but many of them will leave you with a sense of wonder and awe and gratitude that there is such a thing as a computer that those of us who may be homebound, without funds for a vacation, sick, disabled, or merely afraid to get on a plane can visit without leaving our homes. Enjoy! CC - hope you get to go back to work Monday. We would all like to see both of you post more often. Sorry to hear about your MOM! CC says he isn't one of the ones called back yet! That's too bad, I was hoping he got called back. CC update...........He says he got called back........ah there goes the golf game! Hey!! The food was awesome and plentiful. The day was perfect - not too hot and the girls set up tents in a shady area near town where we could people watch too. They had it all planned as to who would bring what. A smart, remarkable group of young ladies! Sounds like a great weekend, cadillac. I like the underwater crystal cave! Trimm this car is for you. Dentist appointment behind you now. Hope all was o.k. and you are good until your next checkup. How lovely that your daughter has friends as you describe. Glad your day was perfect. Can't ask for better than that! Sister, computer shut down the other day when I wanted to tell you how pleased I was to hear you got to the mountains. Waiting to hear all about it. Good Evening Monkeys or a very early Good Morning. Hope every ones doing well. Continued prayers for all in need. So glad to hear CC is back to work. That Sister had a safe trip. Waiting ti hear all about it. Caddy sounds like your visit with daughter was wonderful. 4Donks so glad to see you post. Miss the stories about all your fur babies. Bearly Loved the link you posted. The pictures were awesome. Brandi hope you are still doing well. Love when you post your art work. Trimm How are thing going? Good thing I don't live closer I love biscuits. Now I have a cold and throwing up when I sit up. Seems I am having to dust off and display this image too often, Sister! Page created in 10.223 seconds with 19 queries.